If you don’t have a CD/DVD burner installed in your PC but you are using a networked PC, now with Paragon Net Burner, you can easily “share” a CD/DVD/BD burner at another computer over the network and remotely make a CD/DVD/BD recordable device available for you. The software is offered as free. This solution is extremely helpful for notebook users without CD/DVD/BD burning devices on board. Sharing a HD-DVD/BD device across the network also reduces equipment costs. The installer [2.66 Mb] is digitally signed by Paragon Technologie GmbH. The software installation is clean and requires 2.1 Mb free disk space. Installation asks to crate a desktop icon and to make the software run at startup. As it is well known the usage of network resources allows essentially decreasing office software and hardware installation and supporting costs. The iSCSI technology, which is implemented in this program, enables network users to remotely work with shared CD/DVD recordable devices not only within the local but global net as well. You may choose to select among Full, Client and Server installation. Server Installation operates as a service in the system and makes all local CD/DVD devices available on the network as the iSCSI targets, so client computers can access them. Client Installation enables to mount a shared CD/DVD device in the system to remotely work with it as if installed locally. It installs a service for running the application. 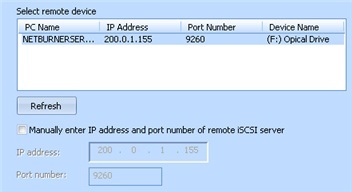 At the end of installation it asks to keep few ports of your firewall [9260, 9261 & 9262] open. Otherwise, firewall can block communication between Client & Server side of Net Burner. 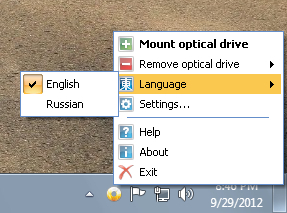 The software multilingual: supports English & Russian. The software runs from tray. Supported Removable Media: CD-R/RW, DVD-R/RW, DVD+R/RW, DVD+/-R (DL), BD-R/RE & HD-DVD. 1. Make sure the Net Burner Server component is installed and active at least on one computer with a CD/DVD device. 2. Install the Net Burner Client component on a computer where you need access to that CD/DVD device. 3. Once you’ve installed Net Burner Client, you can see its icon in the system tray. Just double click on it. 4. The program will automatically scan for available remote devices. 5. All found devices will be displayed on the list. Select the required device (if several). By marking the appropriate checkbox, you’ve got the option to manually set an IP address and a port number of a particular device if it’s not been found automatically or click the Refresh button to re-scan the network. 6. 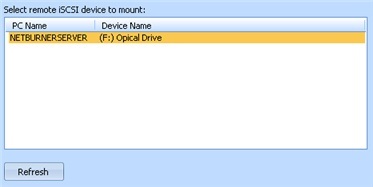 Confirm your choice to mount the selected device in the system by clicking the Next button. 7. The program will notify you once the operation has been accomplished. It will also display an IQN-iSCSI-qualified name of the mounted device and a drive letter it’s been assigned. 1. Right click of the mouse button on the Net Burner icon in the system tray and then select the required device in the appropriate menu (if several). 2. Confirm the operation by clicking the Next button. 3. The program will notify you once the operation has been accomplished. For a free license of the software, you need to register the software in the following link. After registering, you will receive license and download link from eservice@paragon-software.com. The download link is temporary. Later you will be able to manage your account by going to your account. This entry was posted in CD/DVD Management, Free, Software, Windows.